Are you planning a trip to Japan? Would you like to improve your Japanese language skills? 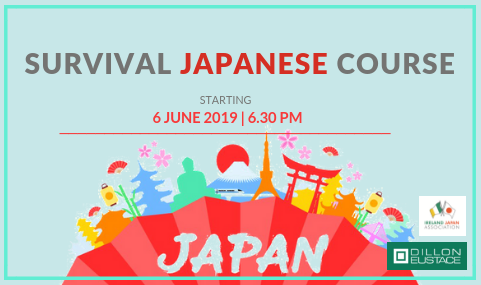 Then why not sign up for our Survival Japanese Language Course which will provide you with essential language knowledge and useful tips that will allow you to enjoy your visit to Japan even more! Spaces are limited and early booking is advised. * How to express your interests, preferences, gratitude, etc. Participants with very little or no previous knowledge of Japanese are welcome. All materials and handouts will be provided and are included in the price. Class size is kept relatively small and participants will have the opportunity to interact a lot with the teacher and fellow students. To book your place, please RSVP by Friday, 31st May 2019 by email: info@ija.ie, or call: 01-6787008. Please note that cancellations should be made at least 48 hours in advance.